I've only been a member of this community for a little over a month and my TOMY figure collection has already more than doubled! I just wanted to show you guys and thank everyone who sold me figures and helped me get closer to catching them all! In terms of I<3eevee news, it seems that the first wave of keychain plush (eevee, vaporeon, leafeon, umbreon) will be re-released in the UFO machines this December. I'm not sure what this means for the banpresto merch suppliers, but in any case it's a second chance for people who missed out on the first wave to get them! I really like Pokémon. 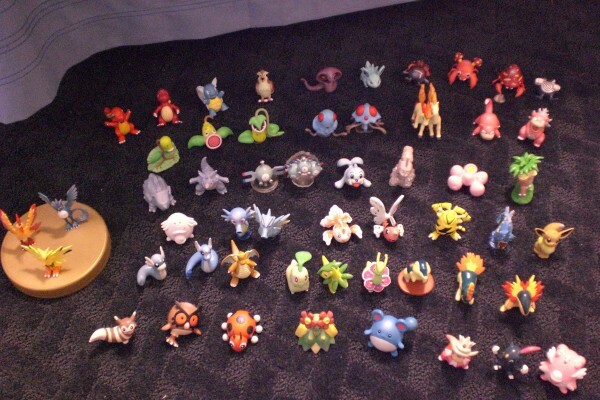 I was born during the time of Generation I. I've been to a Pokémon Convention before and I actually have some little figures from it. One's a Bulbasaur and one is Minun. I have two heavy binders full of cards. I also have a Pokémon Black and White tin box full of cards. I collect mainly cards, my best being a Shining Celebi from Neo Destiny, I believe. So I've got the itch to sew again so I'm doing something I haven't in a long time... opening commissions! Sell me your Krabs and Crawfish! Or anything else you might have! Eevee Collection 2012- A Collection Update. I didn't buy out the whole collection (16 with no job! Ha!) but I was able to get a nice chunk of it! So cute!! I love them so much, ohmy. So, that's it from me for Eevee collection! Maybe I'll get more soon, but who knows. For now I'm pretty content! Just need to get the rest of the Glacies, since she's the only one I really collect! But I hope you enjoyed my pictures! Feel free to use them for wants lists if you'd like. A wild Custom has appeared! Sales Update - Medals, Tops, and assorted goodness! I came across a box of fun little Korean tops I'd like to sell! I don't know much about them, just a lucky eBay find. 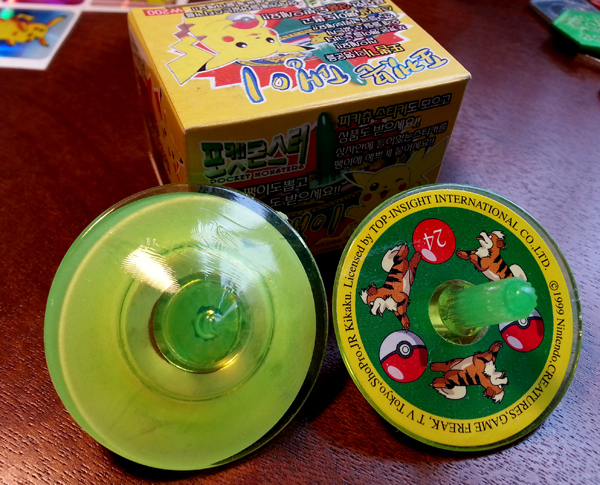 They may be, like most other Pokemon doodads, a little "battling" system, based on the numbers on the side? I was surprised that they're sturdier than they look! The base looked hollow to me, but turns out to be solid, pretty dense plastic. 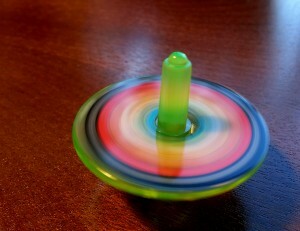 They also spin wonderfully! 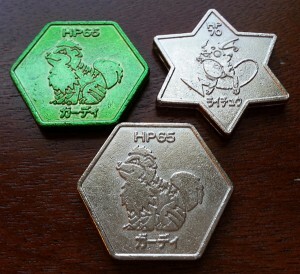 I've got these tops, LOTS of my previous battling medals/coins left (seriously if they are not marked "sold out" then go ahead and order one, I've got handfuls of multiples in many cases), three Growlithe/Raichu medals still up for auction (they end Tuesday!) and a couple of other random doodads for sale as well! Like bottlecaps, metal tags, pinback badges, and of course, silly bootleggy sickers of Pikachu looking very interested in hearing about your day. 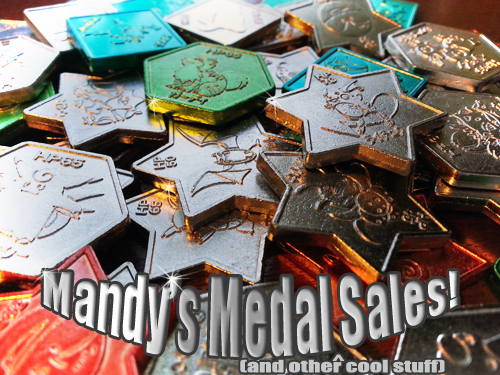 "Golly those are pretty medals..."
Click on any of the pictures in this post to head over to my sales page - thanks for looking! Hey all, I have some good and bad news regarding the metal figure GAs! We managed to win one but even with everyone's help, someone else using SMJ unfortunately just had a higher bid than our combined total for the lot that I cohosted with oozombiejesusoo. AH. WHAT IS ALL THIS. Next, on eBay I managed to find on of the laying-down Skitty plush I've wanted for so long for a real decent price as well as a Blitzle plush. Yay! And now, I found a grail? at a local yard sale today. I wanted to know what you all thought. C; I payed only a whopping .50 cents for him! Finally, I found these guys at the yard sale as well for .50 cent each. Except, I don't know what they are. Ornaments? The Pikachu is THE cutest. You gotta check 'im out! 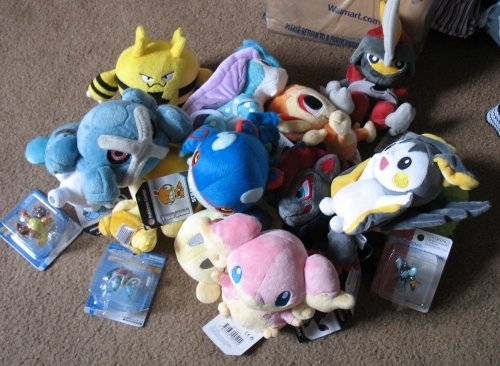 I am auctioning off my TOMY recall plushes of Charizard and Blastoise. They are both mint and come with attached drawstring bags! ~As for the straight sales, I am open to haggling if there is an item that says "OBO" next to it, or if an item seems to be too over-priced. Reshiram & Zekrom pokedolls with U.S. styled tags. The way the hang tags/tush tags look and are attached seem awkward/wrong of course (and are more than likely factory rejects since they're from China), but I can't help but be curious about them (due to the fact that they have a U.S. style tag). And as far as I see, they don't seem to have a number of flaws like most booties. 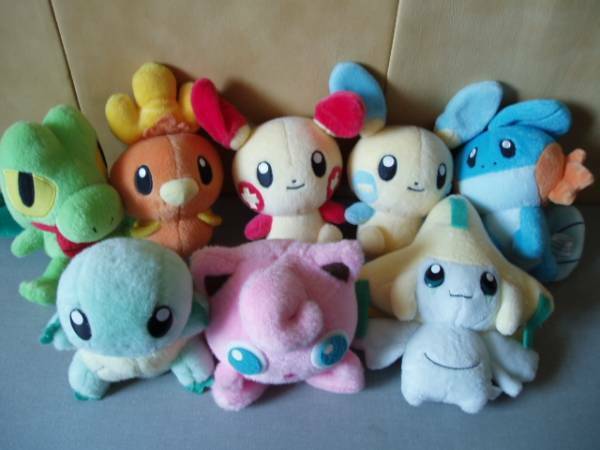 I recall sometime ago people on the comm came across the old starter pokemon pokedolls in a similar fashion on ebay/amazon (and they were later officially released at the Nintendo World Store & Pokemon Center kiosks). So, is it possible that we might see a U.S. Reshiram & Zekrom pokedoll release sometime in the future? I'm not saying that it's totally possible or will even happen, but I thought this was a very interesting find. Anything of the Totodile-line, mostly non flats, plush/figures. Game question, and ID help? My dog just chewed up my copy of Pokemon White. So. Uhm. Part of me wants to get a replacement, asap. But, at the same time, I've already beaten it and traded all the Pokemon I cared about into White2 by now. It's not really the same as regular merchandise, you know? Can anyone tell if this Mudkip is minky? I'm terrible at telling fabrics apart without closeups. If it is, then I may be interested in running a GA for this little lot, as long as nobody else has been planning the same. If not... I might get that keychain one going instead. EDIT: I'll do the plush lot! Does anyone want to run threads so that it can go up tonight? We have 3 days. MPC prices have dropped a few dollars since last time. Casually Seeking The New Eeveelution Binder Page (With Cards) x2!